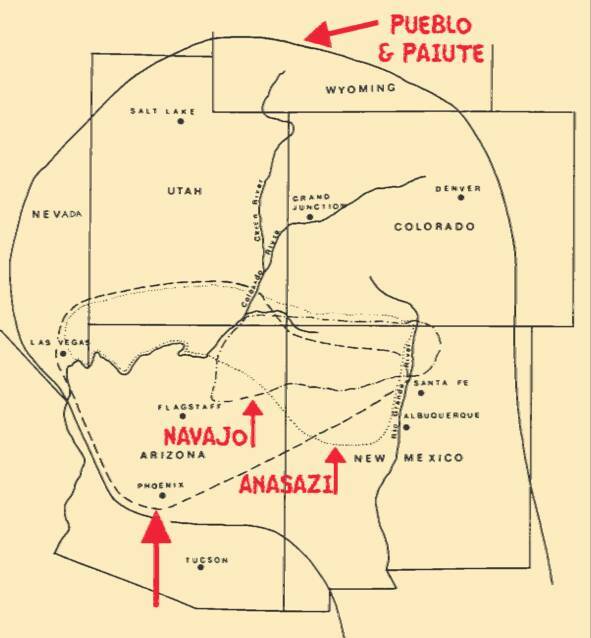 Information about Petroglyphs, Links to Petroglyph History, Locations and examples. "KOKOPELLI"--(Pronounced "Coke-a-pellie") The kokopelli figure is found throughout the Southwest and as far south as South American on ancient rock art carvings and paintings dating back as far as 3,000 years ago. He is one of the most intriguing rock art images to have survived through ancient Indian mythology. To some he is known as a magician, to others he was a storyteller, teacher, healer, trickster, trader, medicine man or a god of fertility assuring success in hunting, growing crops and human conception. Some petroglyph images portray him with a hump on his back so he may have been a trader who traveled throughout the southwest carrying his goods in a sack slung across his back. There are many interpretations of the meaning of his pack and his flute. Some say he carried seeds and rainbows in his pack and his flute played music bestowing warmth and love or it is possible his flute really was a medicine pipe. Kokopelli is so irresistibly charismatic that he has been reinvented over and over again by storytellers and artists throughout the years. Our Kokopelli figure is our own stylized design created to depict him as a hiker in Zion National Park. "RAINDANCER OR RAINMAKER"--This rock art image is believed to be a shaman figure or medicine man (who were not necessarily male). Their mission was to secure the help of the spirit world for the benefit of the community. This might be the shaman "Midewinwin," a medicine woman who performed in the dance ceremonies when the crops were being planted to insure rain and a bountiful crop. The "Rainmaker" is often depicted with symbols for "CLOUDS, RAIN & RAINBOWS" which represented change, renewal and fertility. "SHAMAN & WARRIOR FIGURES"--Petroglyphs with wide shoulders and tapering bodies were created by the Fremont Indians of Utah. This graphic was created using two separate rock art figures. Each of the figures are wearing headdresses and the circle on the shaman (figure in the center) might represent a piece of jewelry. Outlines of "HANDS" were made by spattering paint over a hand as it lay against a rock surface and other hand prints were made by actually pressing a hand covered with wet paint against the surface. Various interpretations of the hand print include: love, healing, a holy place, a family marker, a ceremonial signature, prayer or maybe it simply signified that they had been at that particular spot. The "SPIRAL" might represent ripples on a pool of water. Others believe a "SPIRAL" represents life, power, migration or a journey. A "HAND" with a "SPIRAL" might denote healing. "SUN, MOON, STARS" could be symbols for guidance. The "SUN" might also represent life, protection and/or goodness. Indian peoples throughout North America created rock art in ancient times. Its meaning is mysterious and open to many different interpretations. Modern man will never know the true meanings of the images. Some people think that rock art is a type of storytelling or recording of history & events, others believe it depicts religious or spiritual beliefs while others feel it is merely an artistic expression. Nevertheless, the meaning of these carvings is closely related to the beliefs of the ancient natives who created them. There are two types of rock art, pictographs and petroglyphs. 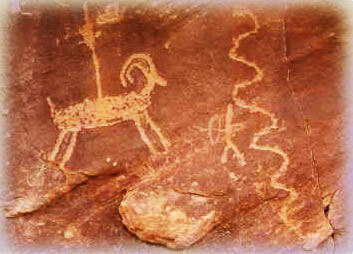 Petroglyphs are images created by removing part of a rock by carving or engraving. This term is made out of two Greek words "petros" (stone) and "gliphein" (to carve). Pictographs are images painted on rocks and the word is derived from"picto" (Latin) meaning to paint and "graph" (Greek) meaning to write. The most common way of creating a stone petroglyph was by using a sharp flint with a point. The flint was held against the rock surface and struck sharply with another heavier stone to create small dents one at a time. The numerous small pits that went into a moderately complex figure such as a spiral had to be placed with great precision, otherwise the design could be ruined. Typically it took anywhere from 25 to 100 dents per inch to create a petroglyph. The technique of painting pictographs came after petroglyphs. Coloring materials were created from iron minerals commonly found in sedimentary rocks. The minerals were pulverized and mixed with plant juice, animal oil or some other liquid. Brushes used to apply the paint were created from plant fibers or animal hair. Most of the rock art located in the Zion Canyon area are petroglyphs created by the Anasazi Indians. It is best to check at the Information Center in the Park for sites that are accessible and available for viewing.